What’s Next for The Avengers? By now, everyone and their mothers have seen The Avengers (review here). But now the question on everyone’s mind is “What next?” Well, thankfully, we have a pretty good idea of what’s next, thanks to casting announcements, comic book storylines, and Hollywood tips. We’re going to cover this chronologically, as we look at the next movies to come out: Iron Man 3, Thor 2, Captain America 2, and The Avengers 2. We’ll also introduce the concepts of Guardians of the Galaxy and Ant-Man. In less than one year, Iron Man 3 will be hitting theaters. Crazy right? Well, thanks to some casting announcements, we have a pretty good idea of where they’re going. In the Iron Man comic series, there was an arc called “Extremis,” which revolves around Tony Stark discovering a lab that is trying to replicate Captain America’s super-soldier serum by using nanotechnology (a living computer virus). Guy Pearce (Memento, Lockout) has been cast as one of the main scientists involved. And then we have the casting of Ben Kingsley. Check out the resemblence of Kingsley to the Mandarin. Pretty close. 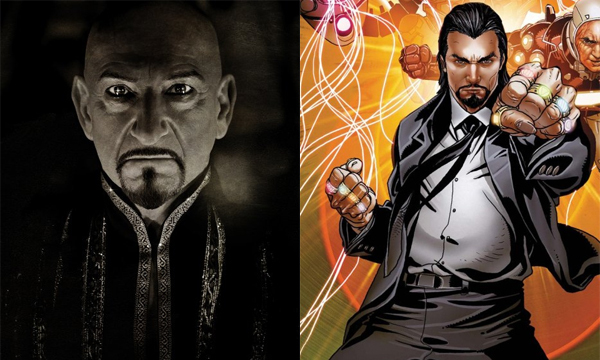 Now, rumors have been floating around that Kingsley won’t play a literal Mandarin but rather the non-fantastical leader of a crime syndicate that gets its hands on the extremis “virus” and uses it to create super soldiers. I guess images were shown at recent conventions that say Kingsley looks like an 80s rock star version of Mandarin, which is kind of intriguing. This storyline is a pretty solid choice. It changes location (most of the shooting is currently happening in China) and gives Iron Man an enemy different than both The Iron Monger in Iron Man and Whiplash in Iron Man 2. It also closes out the mystery of who the men were in the first film. Also, since Tony had solved the problem with Palladium poisoning, he needs a new challenge so this change of scenery would do wonders. Now there’s the question of The Hulk. Mark Ruffalo has signed a deal with Marvel for up to six(!) more films but Marvel Studios President Kevin Fiege came out to Huffington Post (here) saying that they likely won’t do a second Incredible Hulk. This makes sense to me, as The Hulk really isn’t a standalone character on the big screen. So… after the ending of The Avengers when Banner and Stark drive off together, is there a possibly of The Hulk showing up in Iron Man 3? I’d give a strong yes. Hopefully it’s more than a cameo. Bruce Banner is a genius, so Stark may need some help to tackle the problem of the extremis virus. Iron Man and the Hulk have a history of colliding, even to the point where Tony Stark had to create a special suit just to defeat The Hulk. It’d be pretty awesome if Iron Man 3 opened with Stark hunting down the Hulk (in his above-pictured “Hulkbuster” armor) and subduing him. After Banner comes to, the extremis virus can come into play and Stark can utilize Banner for his smarts. The Hulk can have a few awesome fight scenes but not have to carry the burden of an entire movie. 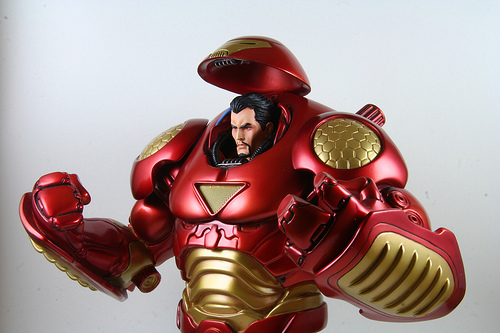 Update: In the latest trailer for Iron Man 3, we see the Hulkbuster armor in action! Does this mean a battle between the two, or did Stark don the armor for another reason? Immediately on the heels of Iron Man 3 will come Thor 2. Now, much less is known about Thor 2 as very little details have been given or new casting unveiled. With how The Avengers ended, with Loki locked up and being dragged back to Asgard, I can imagine an amazing story ahead with some very pivotal villains from the comic books. Loki has two powerful friends called The Enchantress and The Executioner. The Enchantress is able to create illusions and play with peoples’ minds, while The Executioner is a brute but also able to travel through space using his axe. If Loki were caught in some sort of crazy Asgardian prison or otherworldly plane, these would be the two most likely to release him. But to release Loki, they’d need to distract Thor. The first half of the movie could likely focus on Thor’s adjustment to living on Earth, his relationship with Jane Foster (Natalie Portman), and possibly Odin’s return to power. 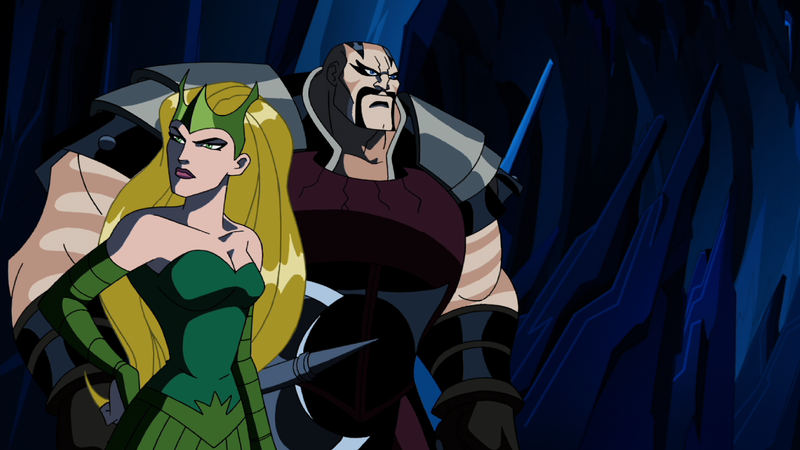 But then, Enchantress and Executioner arrive on Earth to cause chaos and distract Thor while they plan Loki’s escape. I hope for some sort of storyline (of significance) for Sif and the Warriors Three because they seemed like afterthoughts in Thor. Maybe if they are responsible for protecting Earth while Thor guards Loki or something, it might give them something substantial to do. Chris Hemsworth (Thor) has come out in saying that he hopes this film feels much more organic, as opposed to the first Thor which was very digital feeling. Director Alan Taylor has done a lot of television, including Game of Thrones, Lost, Sopranos, Mad Men, and more, but Hemsworth hopes that Taylor brings what he’s done for Game of Thrones specifically to the screen, the sense that the land is real. I would agree wholeheartedly. One of my biggest complaints about Thor was that Asgard didn’t feel like a real location. Recent announcements came out that this film was going to be officially titled Thor 2: The Dark World. Other casting news and leaks from the stunt team would confirm that the storyline follows that of the dark elves. In the comic books, there is an evil dark elf named Malekith that seeks the Casket of Ancient Winters (which was featured in Thor, as the frost giants used it to create ice weapons). Would a film like this have room for Malekith and the Enchantress/Executioner? We’ll have to see. Marvel Studios President Kevin Fiege (the man who managed to pull off the whole chain reaction which led to The Avengers) has said that Captain America 2 will be the closest film to The Avengers. Iron Man 3 and Thor 2 will both be singular movies really about those characters and their struggles. Captain America’s struggles are tied to S.H.I.E.L.D. and learning to live in this world. Nick Fury (Samuel L. Jackson) will likely play a large part in Captain America 2, as will other S.H.I.E.L.D. agents likely including Hawkeye (Jeremy Renner), Black Widow (Scarlett Johannson), and Fury’s second-in-command Maria Hill (Cobie Smulders). Captain America learning to live in the here and now is interesting, but for a dynamic superhero movie, we need some sort of villain. In Captain America, we meet Bucky Barnes, who is Cap’s friend until Bucky is dropped from a moving train into the snow-capped mountains. Well, spoiler alert, he may not be dead. There is an arc in the comics which features a Bucky who was saved by the Russians, though he had amnesia. He was then trained to be an assassin named The Winter Soldier. Somehow there is some sort of cold-storage preservation involved, so that Bucky is still relatively young when Captain America wakes up in the present. It’s been confirmed that the movie is titled Captain America: Winter Soldier, so it seems a sure thing. Cap would track down this Russian assassin and find out that it’s his long-lost friend, who has no memory of the Captain. This story could be action-packed, full of flashbacks, and would give Chris Evans some serious emotion-fueled scenes to work with. 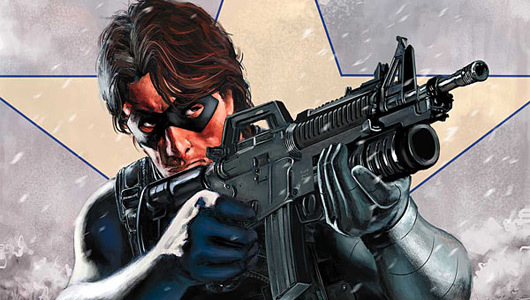 There’s also news that a new hero will make his debut in Captain America: Winter Soldier. Enter: The Falcon. I’m not sure how The Falcon will play a part in this movie but I’m excited to see Marvel break some new ground. Assuming that the Marvel Studios team is intending to follow-up with the post credits scene involving Thanos, we already know a fair deal about the villain. This isn’t muchof a spoiler, since 90% of you won’t even recognize the name Thanos and his appearance in The Avengers is minimal. Thanos is a world-conquering alien being that it seeking to become god-like by acquiring gems to place in what he calls the Infinity Gauntlet. Once all these gems are found, he becomes all-seeing, all-knowing, and all-powerful. Thanos will likely rally the same type of troops, but we’ll need some fresh enemies to keep the battles interesting and unique. The movie will have to up the ante, so expect bigger and badder enemies this next time around. If Thanos is able to travel through different worlds/dimensions/what have you, imagine the enemies he could conjure. I also expect that with The Avengers 2, we’ll have some new additions to the team. There is an Ant-Man film in the works, courtesy of Edgar Wright (director of Shaun of the Dead, Hot Fuzz, and Scott Pilgrim vs the World) which will likely introduce Ant-Man and his counterpart lady-friend The Wasp. If Marvel Studios could make Thor work, I don’t doubt their ability to make this work as well. I can also think of a hero whose origin story could likely coincide with the arrival of Thanos. In the African nation of Wakanda, there exists a precious metal called “vibranium,” which is the metal that Captain America’s shield was made out of. To battle Thanos and his other-worldly troops, this metal may come in handy. But the problem is that Wakanda is under siege by another African leader who is trying to steal the throne. Young Prince (and soon King) T’Challa bears the mantle of the Black Panther. He is often called “the Batman of the Marvel universe.” He is incredibly smart and uses gadgets and technology to outdo villains instead of supernatural powers. In their efforts to defeat Thanos, it is likely that the Avengers could run into the Black Panther and (through some convincing) recruit him to fight alongside them. There is one Marvel movie on the books that I am pretty unfamiliar with, so I did some research to help us all understand what’s coming. Since audiences responded well to both Thor and The Avengers, it looks like Marvel feels comfortable doing a full-on science fiction movie, broadening the Marvel universe even more. In the Marvel comics, the Guardians of the Galaxy help fight battles on a much larger scale, so how does that tie in with leading up to The Avengers 2? My thought is that they’ll use this film to introduce the threat of Thanos and possibly his rise to power. So when the new Avengers film comes out just months later, Thanos will be a familiar face and they can cut straight to the action. The cast they’ve gone with for the Guardians is pretty interesting, at least aesthetically. I know little about these heroes and what they can do, but the concept art definitely intrigues me and I have full faith in the Marvel team. Since it’s a little more out there, it’ll likely lack the box office punch of The Avengers but hopefully a good script can make sure that it’s a solid addition to this series of films. Update! Check out this post to get the full scoop of the Guardians team and what they do (and how Thanos might be involved!). Joss Whedon has already signed on to write and direct The Avengers 2. With that, he was also signed on to create a new television series based on S.H.I.E.L.D. and what happens there. ABC has already gave the go-ahead for a pilot that Whedon will likely write and direct himself. It’s no surprise that ABC was the network chosen, as Marvel and ABC are both owned by Disney. But as NBC’s ratings aren’t too hot and FOX has a reputation for cancelling series prematurely, I’m excited that ABC might have the money and the ratings to make sure the show lasts. Now in terms of what the show will cover… Whedon already said that the show will be “autonomous,” meaning it won’t likely overlap with the Avengers films but it’ll of course be set in the same world. This is a great chance to introduce heroes and characters that may not be dynamic enough to make a big-screen appearance just yet. I’ve been watching the show Alphas recently and I’ve been really impressed with what they’ve done, so hopefully that same kind of care and attention (plus an undoubtedly larger budget) will make S.H.I.E.L.D. an incredible and sustainable project. This second phase of the so-called Marvel Cinematic Universe is looking to be an exciting one. The audiences have already given their approval that they’re ready for more intense storylines so we’ll see how they react to the new directions with projects like Guardians of the Galaxy and the television show focused on S.H.I.E.L.D. As more news is unveiled, keep an eye out here. This entry was posted in Movies and tagged adam ryen daniels, antman, avengers, ben kingsley, black widow, captain america, captain america 2, chris evans, chris hemsworth, dark world, extremis, falcon, guardians of the galaxy, guy pearce, gwyneth paltrow, hawkeye, hulk, i am your target demographic, iron man, iron man 3, jeremy renner, joss whedon, loki, mark ruffalo, nick fury, robert downey jr, samuel l jackson, scarlett johannson, shield, shield television show, super soldier, thanos, thor, thor 2, wasp, what's next, winter soldier. Bookmark the permalink. 1 Response to What’s Next for The Avengers?